Charles Lindbergh was one of the most famous men in America in the 1920s and 30s. When his 20-month old baby was kidnapped the entire country was swarmed by a media frenzy that gripped the nation. After the discovery of a body, it was presumed the child had been murdered. However, despite a successful prosecution against the presumed killer, conspiracy theories still surround the child's disappearance. At the time of the kidnapping of Charles Augustus Lindbergh Jr in 1932, his father, Charles Lindbergh, was one of the most famous men in America. His solo flight across the Atlantic, from New York to Paris, in May 1927, was the first ever and he shot to international fame. He was dubbed ‘The Lone Eagle’ by an avid press corps, who scrambled daily for details of his glamorous life, making him the first international celebrity. Lindbergh married Anne Morrow, the daughter of a wealthy financier and diplomat, in May 1929, and she shared her husband’s passion for flying. She became the first American woman to earn a glider pilot licence, and accompanied her husband on many of his pioneering flights. In the early 1930’s, their glamorous lifestyle provided endless tabloid copy, devoured by a populace in the first throes of the Depression, and broadsheet newspapers were as eager for details as other less salubrious publications. It was into this media maelstrom that Charles Jr, known within the family as ‘Little It’, was born on 22nd June 1930. Neither Lindbergh nor Anne were prepared for the sheer ferocity of press interest and intrusion, and Lindbergh built a home for them on a 390-acre estate in a remote part of New Jersey, as a weekend escape, to minimise intrusion. They spent weekdays at his wife’s family estate in Englewood, New Jersey. On the last weekend of February 1932, the Lindbergh’s deviated from their usual routine, deciding to remain an extra few days at their new weekend home, as baby Charles had contracted a cold. On the evening of Tuesday, 1st March 1932, baby Charles’ nanny, Betty Gow, checked in on her 20-month old charge at about 8pm, It was the last time the boy was seen alive. Lindbergh had been to New York on business that day, returning home at about 8.30pm for dinner with his wife. Before retiring for the evening, Gow went to check on the baby again at 10pm and noticed his cot was empty. She went to check if either of his parents had moved him, at which point it was realised that something was seriously amiss. When questioned later, Lindbergh recalled having heard a noise around 9.15pm, which sounded to him like a crate falling on the floor, but he didn’t investigate the noise at the time. 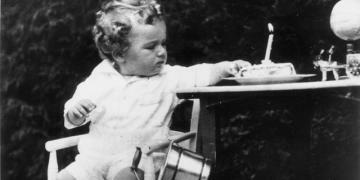 Lindbergh inspected the nursery himself, saw a note on the windowsill, which he didn’t touch, and instructed the estate caretaker to call the police at 10.25pm. He took a rifle and conducted a quick inspection of the grounds around the house. When the police arrived, a more through inspection revealed footprints outside the nursery window, as well as a broken ladder, which had been discarded nearby. No attempts were made, at the time, to take plaster impressions of these footprints, and they were subsequently obscured by other policeman at the crime scene. This later raised questions about the quality of the initial police investigation.